Happy Friday!!! 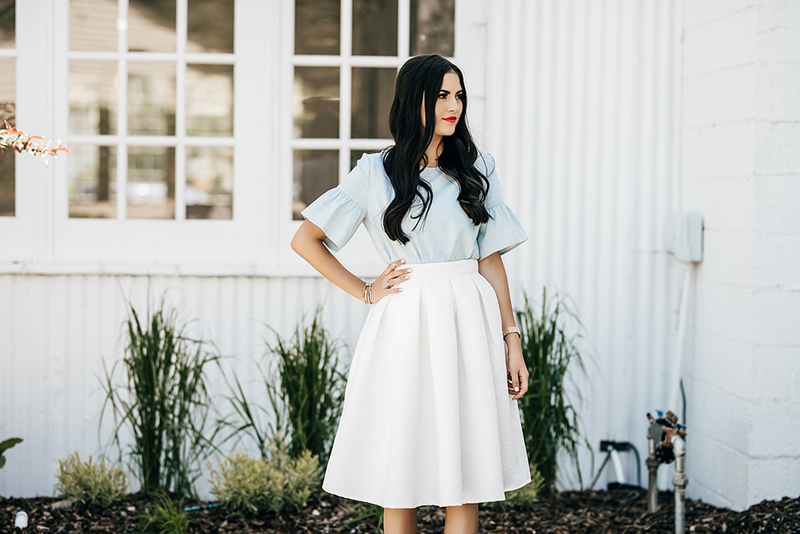 This color combo is one of my favorites to wear during the summer especially around Memorial Day and the Fourth of July; white and chambray with a pop of red lip. 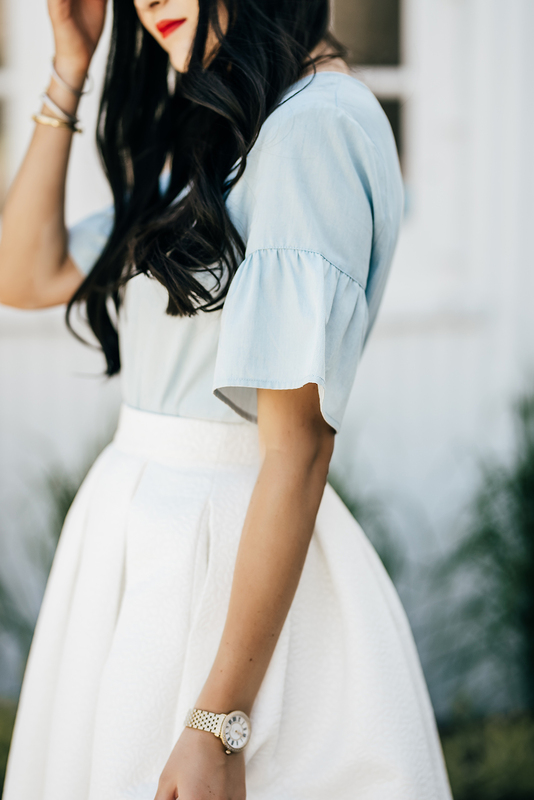 This chambray top is one of the pieces from our Memorial Day Collection that launched last week and I love how flirty and feminine it is! It sold out SO fast but we’ve brought it back, so grab your’s while you can! Also, I’m super excited to be featured in the latest edition of StyleWatch Magazine that hit stands today! This top and our new serendipity ruffle top is also included the feature. I hope you all have a wonderful start to your long Memorial Day weekend! These colors undeniably make a perfect combo and the red lipstick give it the right pop of color. I love both the top and the skirt! And they look so gorgeous together! This is a beautiful outfit! I love that white skirt! ! Congrats on the feature too!! Simple, classy and feminine outfit, you’re rocking it! I LOVE that top! So glad it is re-launching! And hat skirt is so pretty! Obsessed with this look on you, lady! Congrats on the StyleWatch feature!!! Love this color combo! And your shoes are the cutest!! Obsessed with this top and skirt together!! So ladylike! ooh nice skirt! White is such great colour to combine with any other colour! This is such a cute outfit, Rach! So chic and I adore the color combination, which like you’ve said is perfect for both Memorial Day and the 4th! Congrats on the feature, that’s awesome! Thanks so much for sharing and I hope you have a wonderful weekend ahead! The skirt is fabulous and your pictures are just stunning. Such a beautiful skirt! You look super tan here too! Such a pretty, girlie look! Can’t go wrong with blue and white. such a darling Look Rachel. Love this skirt and top! So gorgeous!!! I love that!! Thanks Jessica :) Hope you’re having a great day! Such a gorgeous skirt! Lovely style! I really couldn’t be more in love with this outfit and photography! Perfect look for an elegant occasion. Cute heels. I love this color combination and you’re right, it is perfect for this time of year. I am also really liking the shape of the skirt. I think it’s flattering for many body shapes. Have a great Memorial Day weekend! love how fresh this look is! This outfit is so pretty Rach. Very fresh looking. I’m in love with the colour combo. I have to get my cousin one! Where can I get it? I love this skirt, great combination with those shoes as well.